Pleasant Township was originally populated by Wyandote and Delaware Indians, but the rich, fertile soil made it desirable for homesteading. The first white settler that we know about in the area was William Green, who came in the late 1700’s. As more settlers arrived, some of the Indians stayed, trying to hold on to what they believed was their land in spite of the Treaty of Greenville. When finally the resources necessary to sustain them in the area had been depleted, they moved on peacefully. Some of the earliest settlers in the area were the Hubers, Hampsons, HItes, McNaughtens, Ashbrooks, Geigers, and Ruffners. Most of these families arrived in the early 1800’s, having received land grants from President Thomas Jefferson. John Hampson received a grant of 160 acres in 1804. The Hampson Cemetery is named for his family. Aaron Ashbrook came by wagon from Hamshire County, Virginia in 1805, also in 1805 Adam Geiger from Woodstock Virginia, settled in Walnut and Pleasant Townships. Geiger had 16 children and received a grant of 640 acres. The old cemetery at the north end of the village is naed for his family and a brick home built by Jacob Geiger still stands at the edge of the village. Michael Ruffner came to the village in 1807. In 1808, James Hampson began operating the first gristmill in Pleasant Township. Another gristmill was operated later by the Ruffner Family, and that structure is still standing. The section that is now the original town of Pleasantville was granted to Jacob Lamb on November 21, 1808 from the US Land Office. It was the sold on August 21, 1821 to James Rogers and his wife Nancy for $100. They deeded over five acres of land to John Boston. On this five acres John Boston and surveyor Ewel Jeferies laid out the village in 1828. It was first called Vicksburg, and then New Boston. Eventually, though, it became Pleasantville from the township where it is located, and from Pleasant Run, the principle stream in the area. 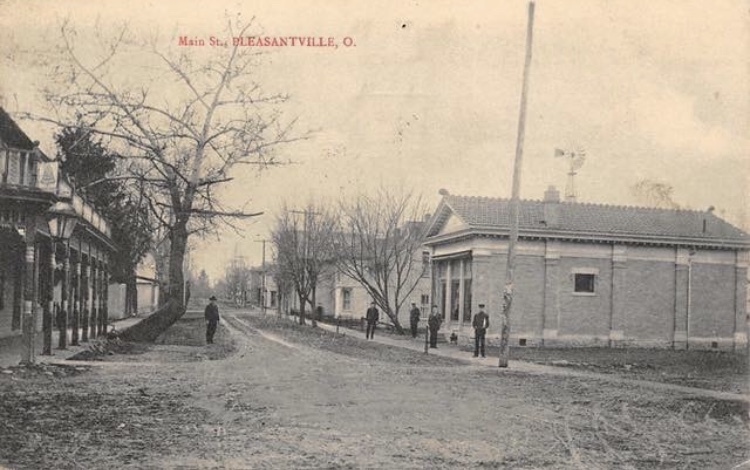 At one point in Ohio history there were two villages named Pleasantville, but the other village had to change their name, as that village was incorporated after Pleasantville, in Fairfield County. Boston secured help from George Sanderson, who had carried the mail over Zane’s Trace, and was familiar with the land Lots were offered for sale on October 6, 1828. Seventeen of the twenty-five were sold at auction ranging from $2.00 to $26.00 each. The village was dedicated the following day. John Boston built the first house in the village, and the first church, in 1829, a log structure. In 1832, John Tenant opened the first store, the first hotel was owned and operated by John Spitler. Other early merchants were Fredrick Lamb and G.P. Hartman. The first post office was opened in 1840. A stage coach shop was built in 1843, which brought in more settlers. In 1849, a frame church building was built, it has been used as an opera house, a furniture store, and an upholstery shop. It is now modernized and used as a private home. The first Methodist Congregation was organized in about 1858 by Reverend J.H. Hamilton. In 1879, the Toledo and Ohio Central railroad was built through the village, the location of the depot resulted in the town shifting eastward toward the railway. By 1883, Pleasantville contained a flour mill, two churches, two dry goods stores operated by William Steward, and four grocery stores, two operated by W.L. Buchanan and T.H. Henry. There were also a drug store run Mills and Sons, a blacksmith shop, wagon maker, harness shop, a canning mill, carriage shop, hardware store, two shoe shops, two barber shops, a marble factory, and a funeral home, complete with horse drawn ambulance, operated by the Hampson family. The Wildermuth Hardware Store was built in 1890. The first road in the area was built in 1803 and was called the Lancaster and Newark (New Ark) Pike. This later became the Lancaster-New Salem Road although some still call it the Pleasantville Road. It now is known as Ohio Route 188 or Lancaster-Thornville Road today, which is Main Street in the village. There were also a number of social and cultural activities in Pleasantville. The I.O.O.F Lodge was organized in 1870, the Masonic Lodge in 1888, and the K. of P. Lodge. During the summers, there were the Chautaquas with shows and concerts. A picture show was run by C. Berry Linville was held in a tent, and a Medicine Man sold liniment as well as entertaining the crowds. There was also a village band and baseball team. Before Prohibition there were also several saloons in town. The village was incorporated in 1886. The first mayor was David Pence. During the Spanish-American Ware, 1898-1899, an Army platoon trained in Pleasantville, and later during World War I (1917) the Co. D 7th Ohio Infantry was housed in Pleasantville at the old Academy. In the early 1900’s a glass factory (built in 1904) was the first to be built in Fairfield County, operated mostly by Belgian workers. There were three gas wells in Pleasantville, and lines laid throughout the village by Irish workers. There were ten streetlights also fueled by gas, as well as private residences. A newspaper called the “Pleasant Times” was published. In 1914, the hardware, grocery, meat market, post office, barbershop, and the Masonic Lodge building on East Columbus Street all burned and were later relocated on Main Street. In Pleasantville’s early years, education was a main focal point. The Fairfield Union Academy was an early school of higher learning, it was organized in 1860 and met in the Odd Fellows hall in Pleasantville. The first building for the academy was erected in 1861 on land granted to the school in the same year by John and Catherine Ashbrook. Additional land grants were made by the Ashbrook’s and the academy continued to serve the community until the summer of 1903, when it held its last commencement and closed its doors. The academy had two brick buildings; a dormitory which contained rooms for students, reading room, and boarding hall; the other building contained a chapel, recitation room, cabinet and society rooms. The tuition was $8.00 per three-month term, rooms were $2.00 per week, and board was $1.50 per week. These buildings were then torn down in 1923. After the closing of the academy, the land then became part of the Pleasantville School system and the Pleasantville High School was erected. The first class to graduate from the high school was in 1924. In addition to the high school, Pleasantville had an elementary school and the school system was known as the No. 2 District. The land for the elementary school was transferred to the Pleasantville School system by James and Mary Hampson in 1877. The rural schools of Snake Run, Eight Corners, Baptist Corner, and Grange Hall were brought to Pleasantville in the 1920’s. Then Ziegler, Mock, Oakthorpe and Salem Schools also joined the Pleasantville School District. Pleasantville and Rushville School districts consolidated in 1957 to become the Fairfield Union Local School District, named after the academy. In Pleasantville’s early years, education was a main focal point. The Fairfield Union Academy was an early school of higher learning, it was organized in 1860 and met in the Odd Fellows hall in Pleasantville. The first building for the academy was erected in 1861 on land granted to the school in the same year by John and Catherine Ashbrook. Additional land grants were made by the Ashbrook’s and the academy continued to serve the community until the summer of 1903, when it held its last commencement and closed its doors. The academy had two brick buildings; a dormitory which contained rooms for students, reading room, and boarding hall; the other building contained a chapel, recitation room, cabinet and society rooms. These buildings were then torn down in 1923. The Ohio Central Glass Company was built in the early 1900’s and was located on Summit Street, the glass scrap yards were in the area of First and Second Streets. The factory remained open until a fire destroyed the factory, which took multiple fire districts and the help of the City of Columbus to put out. It was the most disastrous fire in the villages history. The cause of the fire was never officially determined, but it was blamed on a hobo that fell asleep while smoking a cigarette near the factory, which started the fire. In the early years the village also had other factories; a canning factory, located on High Street; a flour mill on Columbus Street. During this time the village residents and workers were able to support other businesses, the village had the Keller-Wildermuth Hardware, a grocery store, pharmacy, barber shop, Red and White Store, furniture and clothing stores. As the industry and factories left the village the local businesses changed, but the village was still able to support those business, during the 60’s, 70’s and 80’s, Pleasantville had 3 full service gas stations, a local Kroger that later became an IGA, local shops and restaurants. The only surviving business of past decades is Georges Garage and Repair shop, which is still owned by the George family today. Sometime after Pleasantville was officially named, there was an issue with the U.S. Postal Service because of mail confusion. They discovered that Ohio had two villages named Pleasantville. The other town, being younger, had to change their name.